In the district of Cap Barbaria, and in close proximity to the coast, this whitewashed house of typical Ibizan design and style will keep you relaxed all summer with its tranquil surroundings and far reaching sea views. Newly renovated, Can Blanca is the ideal place to unwind for a week or two and isn’t too far away from the many activities at Playa Migjorn. After a great day out, you can relax on the wonderful terrace and dine al fresco while watching the sun set on another warm summers evening. This Cap Barbaria villa is also perfect for winter holidays with good heating & insulation. Downstairs, the kitchen has everything you need for a sumptuous evening dinner and the cozy living room makes it a perfect getaway for the winter months. There’s also a bedroom with a double bed, and great house bathroom having a toilet and shower. Accessed from the outside, there is a fantastic studio with its own bathroom containing toilet and shower, which is great for teenagers, grandma, or indeed anyone wanting their own space. To the upper level there is an inviting double bedroom, with lovely far reaching views, which connects to the house via a staircase outside. A baby cot is also available for the little one. There is a TV & DVD player in the lounge if in the unlikely event, you are running short of something to do in the evenings. Can Blanca has amazing views across the spectacular Mediterranean to Playa Migjorn and La Mola. It has a fantastic covered terrace, with comfortable seating, providing an oasis from which to escape the midday sun or you can just make the most of the views while sipping a cool drink. For those more energetically inclined, there is a huge 1 hectare of garden planted with pines and shrubs to enjoy and wander around, or if the beach is what you’re craving, then the closest is Playa Migjorn or Cala Saona, being just a short drive away, otherwise there’s a rocky beach closer by to dip your toes in. If you are looking for a Formentera villa to rent that is near the wonderful Mediteranean, Can Blanca is hard to beat for its perfect seaside location. This villa is located in the Cap barbaria area, not far away from the lighthouse. 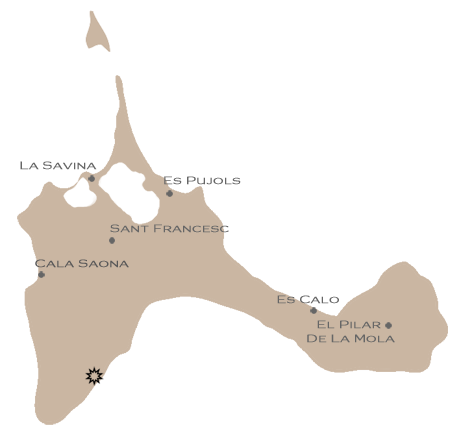 The nearest shop & restaurant is a few minutes drive and the nearest beach is Cala Saona approximately a 10 minute drive. "Sorry for our late reaction, but Can Blanca & Formentera were the best kept secrets in Europe for us! We fell in love with Formentera and its people & tourists and the house was top! We definitively will come back to Formentera! I enclosed some nice pictures"